A calorie is a calorie is the truism that has been the foundation of nutritional wisdom and our beliefs about obesity since the 1960s. 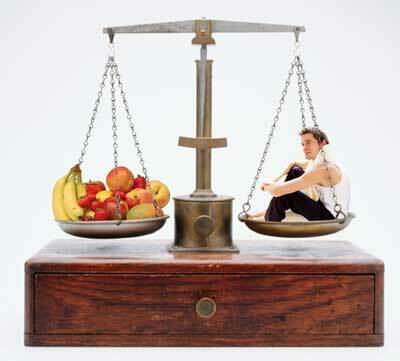 We get fat because we take in more calories than we expend; we get lean if we do the opposite. Anyone who tells you otherwise, by this logic, is trying to sell you something. But not everyone buys this calorie argument. The Journal of the American Medical Association published the results of a clinical trial by Dr. David Ludwig of Boston Children’s Hospital and his collaborators. While the media tended to treat the study as another diet trial — what should we eat to maintain weight loss? — it spoke to a far more fundamental issue: What actually causes obesity? Why do we get fat in the first place? Too many calories? Or something else? Odds are you sometimes think about calories. They are among the most often counted things in the universe. When the calorie was originally conceived it was in the context of human work. More calories meant more capacity for work, more chemical fire with which to get the job done, coal in the human stove. Fat, it has been estimated, has nine calories per gram, whereas carbohydrates and proteins have just four; fiber is sometimes counted separately and gets awarded a piddling two. Every box of every food you have ever bought is labeled based on these estimates; too bad then that they are so often wrong. Chances are we have all have been in a conversation or at least over heard one where a woman expresses how she had to do some extra exercise to burn off some extra food she ate, because she went over her points and only lost six ounces and didn’t get a sticker. “Every woman knows that a carbohydrate is fattening,” as two British dietitians began a 1963 British Journal of Nutrition article. We’re repeatedly told that we suffer mindless eating habits, a toxic food environment, and a host of other influences which lead us to overeat; all of which can be overcome if we simply set our minds to choosing foods wisely, strictly rationing our intake with portion control methods, and sticking to recommended intakes of each food group to target particular ratios of calories from carbohydrates, proteins and fats. When doing these things fails to produce long-term weight management, the individual is often the target of blame – they failed by failing to follow the recommendations. They failed to have adequate willpower to continue as directed. They failed to restrict calories sufficiently enough for the long-term to maintain weight effectively. Rather than challenge the concept – consciously restricting food intake – we instead accept that such is normal and focus on the failure as an execution problem by the individual, often stated many different ways, but always boiling down to calories in exceeding calories out if the individual could only get it right then all would be well. This makes weight loss and management a more of a math problem than a lifestyle. If we stick to this thinking, in order to lose and maintain weight one must then be good at math in order to constantly count their calories in each day to keep consumption within target outputs. “Calories In – Calories Out” is certainly true – but it only describes the situation — it doesn’t explain it. There is a difference between how the body acts in the short term in regards to appetite and weight regulation, and how it works once weight loss gets to a certain point (that point varies probably due to a number of factors, including percentage of body fat lost, how long the person has been losing weight, and a tremendous amount of individual variation). The problem becomes that weight loss itself often begins to trigger the desire for more food. At that point, to maintain the weight loss, it becomes more important to pay attention to intake. To tell you the truth, I blame the diet books for some of this. I know it doesn’t sell books to tell people that there may be limits to the diet in question, but when people aren’t warned, they can possibly let an opportunity slip by. A calorie, by its simplest definition, is a unit of energy and is equivalent to 4.184 absolute J. In the popular press and in the labeling of food products in the United States, a food calorie actually refers to a kilocalorie, or 1000 cal. That is, 1 food cal equals 1 kcal, or the amount of energy needed to raise 1 kg water from 15 to 16 °C. From a thermodynamic viewpoint, a calorie is of course a calorie. The first law of thermodynamics states that energy can be neither created nor destroyed, but only transformed. Thus, the human body is constantly transforming energy—in this case, kilocalories—by combusting foodstuffs to produce heat. Although this concept is widely held today, our knowledge of life as a combustion process is limited to the last 2–3 centuries and arose from a very old and fundamental question. Because humans and animals are warm and animal heat is the essence of being alive, that question, as variously phrased, was, What is the innate fire, the vital force, animal heat? The Greek philosophers Plato, Aristotle, and Hippocrates and the Roman physician Galen thought that the innate fire was in the heart and that it was somehow related to food, but the scientific answer to this question arose, in part, only in the latter half of the 18th century from the work of Lavoisier in France. Lavoisier’s experiments involved the first-ever animal calorimeter, a device used to measure heat production. The outer shell of the calorimeter was packed with snow, which melted to maintain a constant temperature of 0 °C around an inner shell filled with ice. In the core of the inner shell was a wire cage housing a guinea pig. As the ice melted from the heat produced by the guinea pig, the water flowed out of the calorimeter and was collected and weighed. Each kilogram of melted ice water represented 80 kcal heat given off by the animal. Lavoisier noted that, in 10 h, the guinea pig melted 0.37 kg ice, thus producing 29.6 kcal heat (0.37 kg × 80 kcal heat/kg). He concluded, “la respiration est donc une combustion.” That is, respiratory gas exchange is a combustion process, like that of a candle burning. The human body, however, is not a perfect engine, and thus the thermodynamics may not be so pure. It is now known that the energy liberated from the combustion of a food is not identical to the energy available to the body from consumption of that food. The calorie-is-a-calorie notion dates to 1878, when the great German nutritionist Max Rubner established what he called the isodynamic law. This is the concept of “metabolizable energy,” or the difference between the gross energy (as measured by bomb calorimetry) of consumed food and the energy contained in feces and urine (also measured by bomb calorimetry). Rubner showed that a calorie is a calorie; however, he also showed that the human body cannot extract all the calories liberated from combustion of a food and that macronutrients differ according to their chemical composition in the number of calories per unit of weight. It was applied to obesity in the early 1900s by another German — Carl Von Noorden, who was of two minds on the subject. One of his theories suggested that common obesity was all about calories in minus calories out; another, that it was about how the body partitions those calories, either for energy or into storage. This has been the core of the controversy ever since, and it’s never gone away. But, if obesity is a fuel-partitioning problem — a fat-storage defect — then the trigger becomes not the quantity of food available but the quality. Now carbohydrates in the diet become the prime suspects, especially refined and easily digestible carbohydrates (foods that have what’s called a high glycemic index) and sugars. Until the 1960s, carbohydrates were indeed considered a likely suspect in obesity. The obvious mechanism: carbohydrates stimulate secretion of the hormone insulin, which works, among other things, to store fat in our fat cells. At the time, though, the conventional wisdom was beginning its shift: obesity was becoming an energy issue. Medical science has done much to investigate the mechanisms behind disease, but it has only recently begun to study the reasons that people stay healthy based on the foods they eat. Western nutritionists have tended to focus upon the microscopic and micro-molecular mechanisms behind health and disease, but have often lost sight of the bigger picture. Mainstream nutritionists suffer from an extreme narrow mindedness in thinking because of this steadfast focus upon the Newtonian worldview of people as sophisticated biological machines. However, the ancient Egyptians thousands of years ago, had the unique perspective that human beings are more than flesh and blood, proteins, fats, and nucleic acids. They believed that the life-force is part of the spirit that animates all living creatures. It is the radiance, or frozen light that circulates in the body. It is a unique form of vibrational energy that has yet to be fully grasped by Western scientists of the 21st century. This light energy is an aspect of human nature that is not taught in Euro-centric health science, nor well understood by most Western nutritionists. According to our ancient wisdom, food is the means by which we re-create the world as ourselves. Through food, we embody the sun and the cosmic energies of the Universe, regenerating our spiritual essence. Our spiritual nature interacts with the properties of the foods we eat. In the Western nutritional system nutrients are considered equivalent in biological value. According to this principle, a bowl of spaghetti with tomato sauce is equivalent in protein and calories to a two-egg omelet. In addition, people are assumed to be the same physiologically regardless of race, or ethnic background. So the choice of diet is simply a matter of taste preference under these guidelines. Since Western nutritional standards treat people without including the individuals particular bio-chemistry relative to their calculations and medical tests, their treatments are not consistent with “your” physiology and subtle-energetic anatomy. For example, highly melanized people, especially black people must be treated with different health standards than whites. The current nutritional standards sanctioned by the National Academy of Science is based on white chemistry and the daily dietary requirements are prescribed according to the needs of whites, who do not store and radiate energy the way that blacks do. In the Egyptian system of health, a balanced diet is not determined by the presence of fats, carbohydrates, proteins, vitamins, or minerals. These nutrients are known to us by the Western standard of health. For the most part, Western nutrition comes out of laboratory analysis. But, the Egyptian system of nutrition comes directly from the sun. The science of Photo-biogenics which allows us to eat a balance diet naturally, guided by our bio-chemistry. Even if two people were to somehow eat the same sweet potato cooked the same way they would not get the same number of calories. Humans vary in nearly all traits, whether height, skin color, or our guts. Back when it was the craze to measure such variety European scientists discovered that Russian intestines are about five feet longer than those of, say, Italians. This means that those Russians eating the same amount of food as the Italians likely get more out of it. Just why the Russians had (or have) longer intestines is an open question. Surely other peoples differ in their intestines too; and intestines need more study, though I am not going to volunteer to do the dirty work. Estimates of the number of calories in different kinds of foods measure the average number of calories we could get from those foods based only on the proportions of fat, carbohydrates, protein and sometimes fiber they contain (In essence, calories ingested minus calories egested). A variety of standard systems exist, all of which derive from the original developed by Wilbur Atwater more than a hundred years ago. They are all systems of averages. But, No food is average. We also vary in terms of how much of particular enzymes we produce; the descendents of peoples who consumed lots of starchy food tend to produce more amylase, the enzyme that breaks down starch. Then there is the enzyme our bodies use to digest the lactose in milk, lactase. Many (some say most) adults are lactose deficient; they do not produce lactase and so do not break down the lactose in milk. As a result, even if they drink milk they receive far fewer calories from doing so than do individuals who produce lactase. Each of us gets a different number of calories out of identical foods because of who we are and who our ancestors were. Finally, a magically real new literature considers the microbes in and on human bodies. We have known for years that we are covered in microbes and they matter (a lot), but only recently has the study of these microbes become cool, thanks in part to new tools. Differences among individual humans in their symbionts (an organism in a symbiotic relationship) do seem to make differences in how they digest food—individuals appear to differ in their metabolism depending on just which microbes they have. In addition, some microbes are found only in particular people where they appear to play a unique role. For example, in some Japanese populations a gut microbe lives that has stolen genes from a marine bacterium; those genes help the bacterium to break down seaweed (such as that encountered in sushi rolls). So, how you digest food depends on which microbes you have and which microbes you have also differs from one person to the next. Hunter-gatherer diets in the southwestern U.S. once abounded in compounds our bodies are unable to digest but that are readily digested by microbes. Conversely, many modern diets provide very little good food for microbes, very likely to our detriment. Microbes seem likely to suffer on a diet of cheese product and white bread because both are used up by the time they make it to the colon. When all is said and done the good news is we have figured how to make and eat foods in which the calories are maximally available. We process them. We cook them. We ferment them. We cook them again until they actually give us as many calories as the box says. It has been plausibly argued that what made our early human diet unique was cooking and that cooking, in turn, allowed for some morphological changes in our bodies (bigger brains, relatively smaller guts) along with many societal changes. Our ancestors may have combined a preference for cooked food with the unique ability to make it on demand. The mice in one study, interestingly, not only got more energy out of cooked meat, they also preferred it. But for as much as they like grilled steak, they will never invent cooking. We did. If this idea is right, what we inherit as our unique recent history is not the need for some specific amount of meat or fat but instead the preference for as many calories as we can get as quickly as we can get them so that we might have leisure time to invent, organize, and text each other. It is a testament then to human ingenuity that we have now figured out how to provide as many calories as possible in our foods. We don’t even really need for our intestines to do much work, our bacteria either, or even our teeth for that matter. Our modern diets are a measure of our evolutionary success, or at least they would be from the perspective of our Paleo ancestors who needed and wanted excess calories. They are not successes from our modern perspective. We now have too many calories and too many of those calories are of low quality. One in three Americans is now obese. Over the last thirty years the number of calories we eat has increased, but so has the number of those calories that come from highly processed foods. In this light, we would do well to eat fewer processed foods and more raw ones. This is not a novel insight (Such foods, after all, tend to have more nutrients such as B vitamins, phytonutrients and minerals and so are good for reasons having nothing to do with counting calories). But what might be novel is the realization that in eating such foods you could lose weight while keeping the precise tally of the calories you do consume exactly the same. This realization comes hand in hand with another however, namely that how much weight you lose depends on the biology of the plants and animals you choose to eat and who you and your microbes are in ways we are only beginning to understand. One of the worst things you can do that ensures you won’t become a “normal” eater is to regularly ignore hunger signals. People who skip meals when they’re hungry only cause and reinforce appetite disregulation. Frequently avoiding food when your tummy is empty is like refusing to put gas into your car and continuing to drive—eventually you’re going to run into trouble. You may think that hunger is all in your stomach and that dieting is all in your head. But nutrition experts know that hunger is regulated by a complex system of chemicals that send signals between your brain and your body. The cells in the hypothalamus communicate with cells in other parts of the brain to coordinate the release and uptake of chemicals that help regulate how much and what you eat. Food triggers the brain to turn the desire to eat into the act of eating. Those hungry children are everywhere, and with the uncertain economy, the numbers are only growing. And, the consequences of malnutrition can be severe. Several studies have shown that food insecurity affects cognitive development among young children. And for older children, school performance is affected. Additional research shows that with hunger comes more frequent sickness and higher healthcare costs. Medical research has also shown that lack of nutrition can permanently alter a child’s brain architecture, stunting intellectual capacity and a child’s ability to learn and interact with others. As Vicki Escarra, president and CEO of Feeding America says, “the consequences and costs of child hunger make addressing this issue an economic and societal imperative, in addition to an obvious moral obligation. The updated Dietary Guidelines for Americans from the U.S. Department of Agriculture which are funded by the Healthy, Hunger-Free Kids Act of 2010 – legislation promoted by Michelle Obama hoped to provide some change. The new restrictions state that school lunches must have age-aligned calorie maximums, capping the amount of calories high school students eat to around ONLY 850 calories. While the changes may seem like a step in a healthier direction, not all students are finding them so tasty and as parents we shouldn’t either. Some students and teachers from a high school in Kansas have created a YouTube video parody of ‘We Are Young’ by the band Fun, protesting the recent lunch restrictions placed on high school menus, USA Today reported. The video – titled ‘We Are Hungry’ – came just a week after students from a Wisconsin high school boycotted their school lunch over the changes. Despite strong beliefs that hunger is caused biologically, this motivation is controlled not just by physiology, but also psychology as well. What makes human beings different from animals is we eat not only to feed our bodies to satiate physiological hunger, but also to feed our minds to satiate psychological hunger as well. Until we realize that we need to feed our mind with something, rather than eating, we can not feel satiated. Until we recognize it is our mind, not our body which needs food, we cannot be satisfied with what we put in our mouth. Thus, hunger is not only about how the body changes physiologically, it is about how our body and mind together are well fed, not just by the food that one can put in their mouth, but also by the whole environment around us. So, maybe if we look at the issue differently – and seek to understand what truly drives our appetite, we might find that weight is not a math problem, but a chemistry problem! This entry was posted in Uncategorized and tagged "Emotion" in the Hungry Brain, A Calorie is A Calorie, ancient egypt, Calorie, Calorie Detective, children, David Beckham, David Ludwig, Eating, education, egypt, environment, Feeding America, France, health, human, humanity, live, Max Rubner, Michelle Obama, New Dietary Guidelines, New York Times, Science, Shopping, Slim is Simple, TedxTalks, UNICEF, United States, universal, USDA, We Are Hungry, weight loss. Bookmark the permalink. nobody else know such detailed aabout my problem. Yoou are wonderful! sսbject. I love all of tɦe poinntѕ you made.